As home prices continue to ascend, many aspiring buyers are priced out of homeownership — or as one study found, priced out of having a home at all. The DataFace, a San Francisco-based data agency, combed through the pages of the U.S. Department of Housing and Urban Development’s (HUD) latest Annual Homeless Assessment Report (AHAR) and found that eight of the 10 states with the highest homelessness rates also have the nation’s highest median home prices. According to the AHAR, there were approximately 554,000 homeless individuals in the U.S. in 2017, and 193,000 of those individuals were “unsheltered,” meaning they had no access to emergency shelters, transitional housing or safe havens. The total number of homeless people rose (+0.7 percent year-over-year) for the first time since 2010, and the number of “unsheltered” homeless people increased a whopping 9 percent from 2016. The District of Columbia, Hawaii, New York and California had the highest concentration of homelessness, ranging from 110 homeless residents per 10,000 (D.C.) to 34 homeless residents per 10,000 (California). Oregon (34 per 10,000), Washington (29 per 10,000), Nevada (27 per 10,000), Massachusetts (26 per 10,000), Alaska (25 per 10,000) and Colorado (20 per 10,000) rounded out the top 10 states with the highest incidences of homelessness. The states with the highest homelessness rates also had some of the nation’s highest median home prices in 2017. On a state-by-state basis, Hawaii had the highest median sales price ($599,000), followed by the District of Columbia ($550,000), California ($499,500), Massachusetts ($419,900) Colorado ($400,000), Washington ($350,000), Oregon ($350,000) and New York ($340,500). 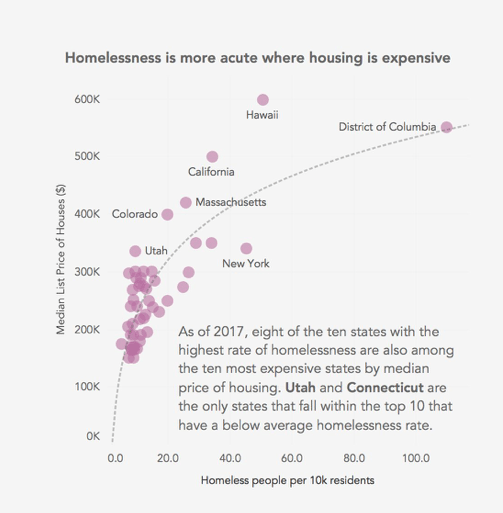 Utah ($334,900) and Connecticut ($300,000) were the only states within the top 10 that had below average homelessness rates — 9 per 10,000 and 10 per 10,000, respectively. “More affordable housing options are needed to combat the homeless crisis, particularly in states on the West Coast,” concluded data scientist Kizley Benedict in the report. The DataFace isn’t the only company to make the connection between rising home and rent prices and homelessness. According to Zillow, there is a direct correlation between rising rent prices and rising homelessness rates in the nation’s 25 largest metros, including New York, Los Angeles, Washington, D.C. and Seattle. In New York City, there are currently an estimated 76,411 homeless people. Zillow data scientists projected that a 5 percent increase in rent would lead to an additional 2,982 people living on the street by 2018. In Los Angeles, there are currently an estimated 59,508 homeless people, and a 5 percent increase in rent would lead to an additional 1,993 people becoming homeless. “We’ve seen so much pressure in rental housing markets that it’s created a rental affordability crisis that has spilled over into a homelessness crisis at lower income levels,” said Zillow Senior Economist Dr. Skylar Olsen in a statement. The count of homeless collected by the Department of Housing and Urban Development are point-in-time (PIT) estimates taken on one night in the last 10 days of January each year. Data is recorded on the national, CoC (Continuum of Care) and state level. Data and reports can be downloaded here. The number of homeless per 10,000 residents for 2017 was calculated by dividing the raw counts of homeless by the total number of residents of the particular state. Count of residents per state was obtained from the “2016 American Community Survey 1-Year Estimates” on census.gov. Data can be downloaded here. The data for median listing price by state are prices as of November 2017 and can be downloaded here.